Updates: I just realized that Flutes has moved from the colonial bungalow in Fort Canning to the National Museum. What a pity, it was such a charming place. The solemnization was a pretty last minutes decision. The original plan was to have the solemnization in April followed by wedding celebration in September. However, my mum's surgery and subsequent chemotherapy threw everything off the plan and we weren't in mood of planning anything. By the end of April, we decided just to hold our ROM first. So in less than 2 months time, we pull together everything and had a small celebration of 17 people, including us. 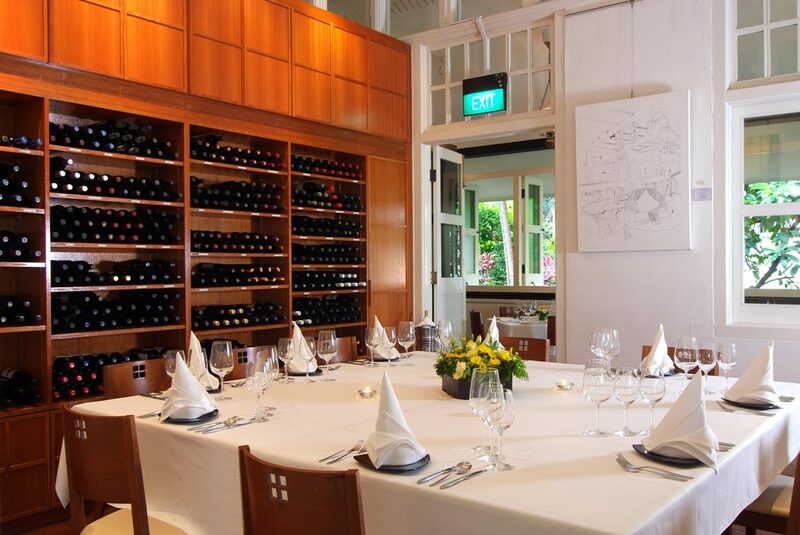 We visited a number of places, including Vineyard at Hort Park, My Humble House (they have a small private dining room), Raffles Hotel's lawn and gazebo. And eventually we settle at Flutes at the Fort as we find the venue is just nice for a ROM celebration of less than 20 pax as it gives you enough privacy and just the correct amount of space. Vineyard at Hort Park is beautiful if you have 50-100 guests. 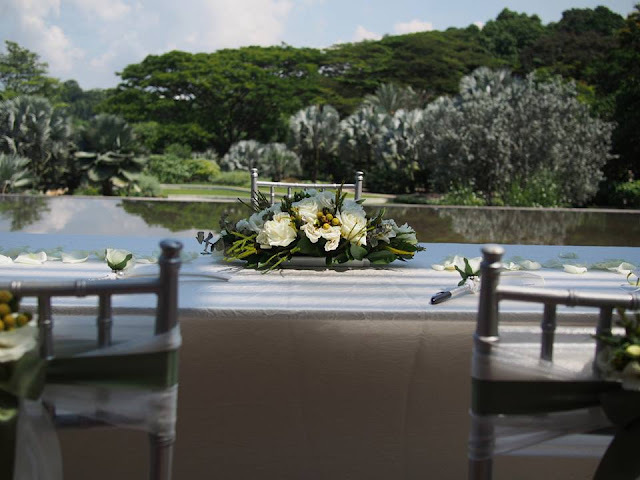 The solemnization took place at a deck overlooking a reflection pool, lawn and beautiful trees. 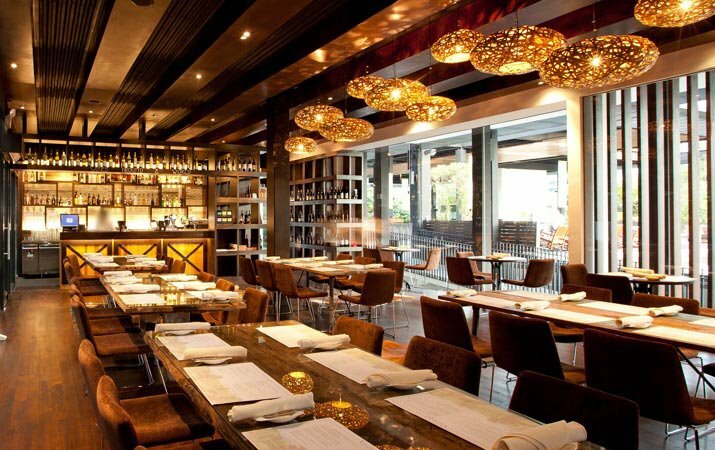 And the restaurant is tastefully decorated. I don't recall they have any private room therefore we didn't choose it. Interior of Vineyard at Hort Park. Pictures from their Facebook. The Humble House private dining room is not able to fit in all our guests while the open dining area does not offer privacy. 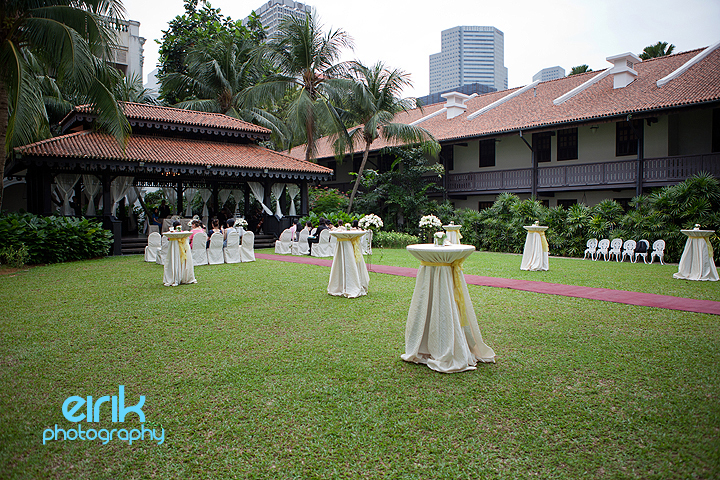 Raffles Hotel's lawn and gazebo is very uniquely Singapore and romantic, however it feels too empty to for 20 guests. Actually, my another favourite will be a Villa Solemnization at The Sentosa. Apparently, The Sentosa is able to set up a solemnization area, complete with sit down tables for meals for 20 to 30 guests at your own 2 bedroom garden villa. 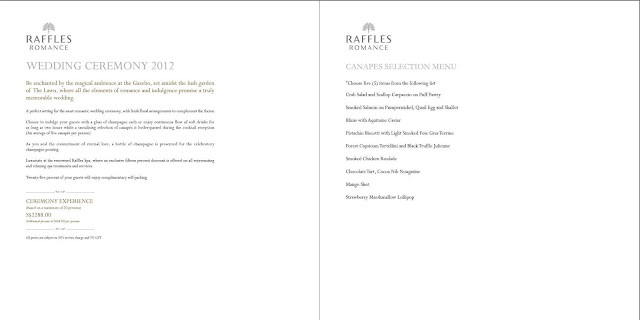 This is as exclusive as one can find for such a small number of guests. Of course, good and convenient stuff comes at a price. 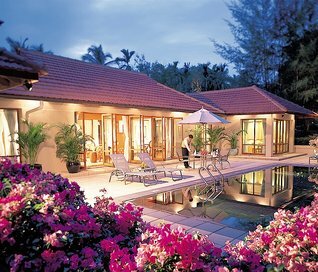 The 2 bedroom garden villa costs $2477++ (2012 price) per night. 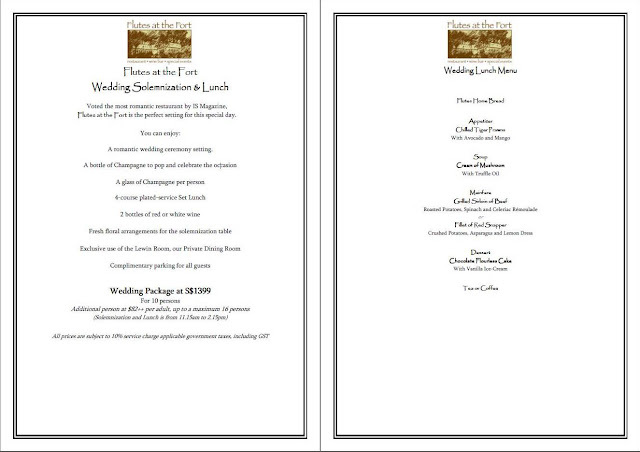 One need to book a minimum of 2 nights stay to hold a lunch solemnization, although dinner solemnization only requires 1 night stay. 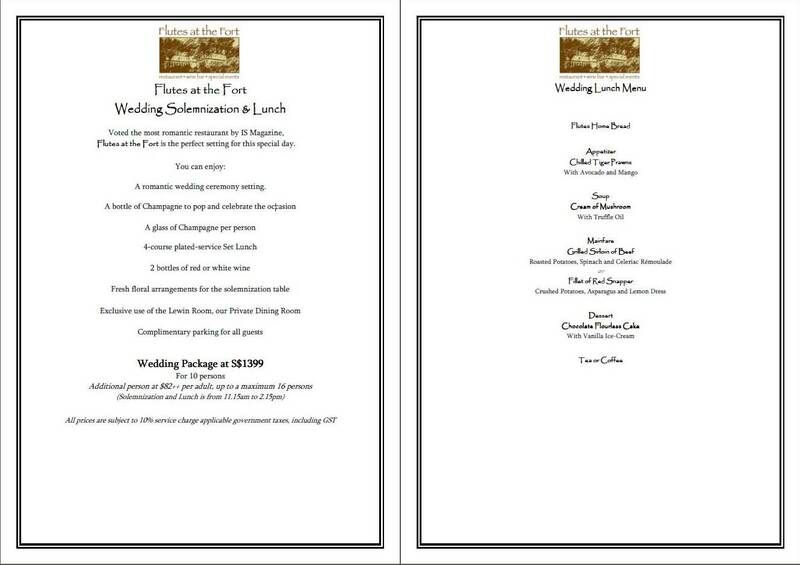 It is also compulsory to cater meal for a minimum of 20 guests at $120++ per person for lunch/dinner and $85++ per person for high tea. Beverages are priced separately. So after Mr knocking in some sense/cents into my head, I decided to forego this option. And I digress, back to Flutes at the Fort. First a brief overview. 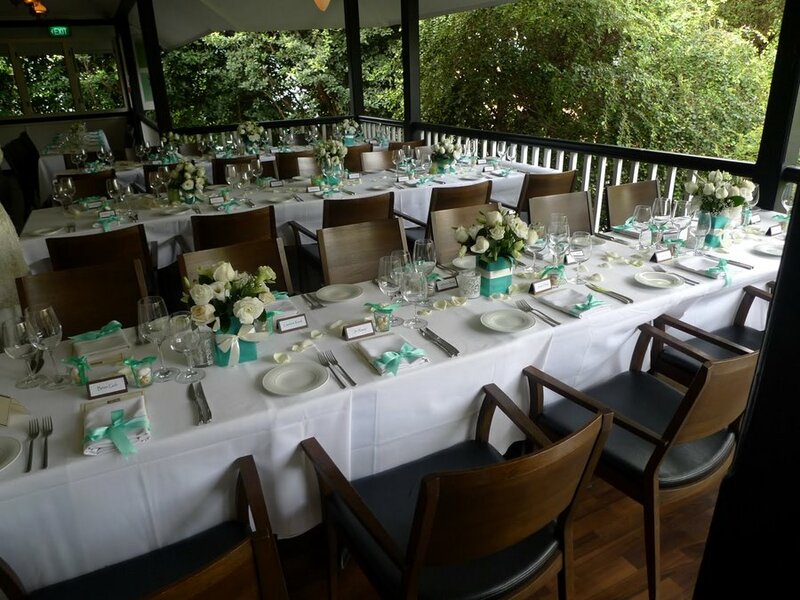 (These location pictures were not mine, we were too busy taking pictures of the guests on the day). Flutes at the Fort was located at a colonial bungalow tucked at a corner of Fort Canning Park (they just moved to the National Museum). The entrance of the restaurant is quite hidden between Civil Defence Heritage Gallery and Singapore Philatelic Museum. 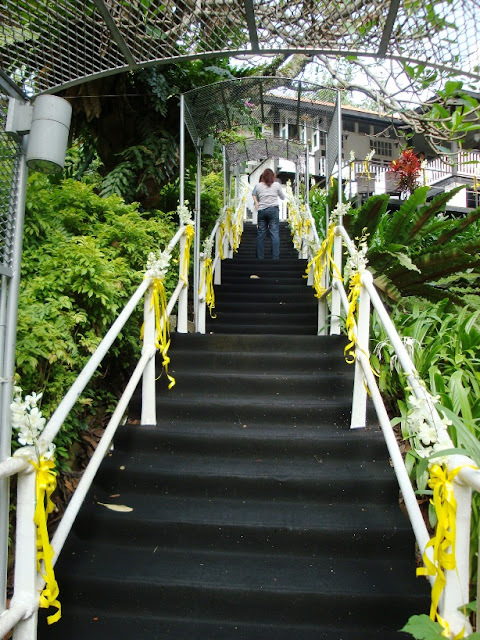 One has to walk through a small car pack before reaching the start of the staircase leading to the bungalow. The bungalow can be divided into 2 levels. The first level is basically a deck where the solemnization take places. There is also a small bar that serves refreshments to the guests and sparkling wine for toast. The 2nd level is where the seating area of the restaurant located. Most of it is al-fresco, with tables set on balcony of the 2nd level. Of course, this is a huge balcony. They have 2 air-conditioned private dining rooms, ie the smaller Levin Room and bigger Fire Chief's Retreat. The maximum capacity of the Levin Room is 16 person, while the Fire Chief's Retreat is able to accommodate 46 person. As usual, I don't think fitting the number of people to the maximum capacity is ideal as it would be too squeezed for comfort. The Fire Chief's Retreat, with seating setup for 24 guests. Pictures courtesy from the Flutes. The main contact person from Flutes at the Fort is Ruth. She is very prompt in answering our queries and extremely nice and helpful while bringing us around the place. These are the standard packages we received when we inquire about having our solemnization at Flutes at the Fort with 10-20 guests. They are either $1399++ for 10 person at The Lewin Room or $3299++ for 24 person at Fire Chief's Retreat. Sparkling wine for toast and bottles of wine are included, which is great. Additional person costs $82++ . Flower arrangement for the solemnization table and dining table (for 24 person package) were also included in the package. For 10 person package, the solemnization table flowers is reused as the dining table flowers. After checking out the actual place, Mr is not that pleased with The Levin Room as it is just too small fit 15 persons comfortably (Our original headcount was 15). So he requested for Fire Chief's Retreat (Ah! Sales! Everything is negotiable). 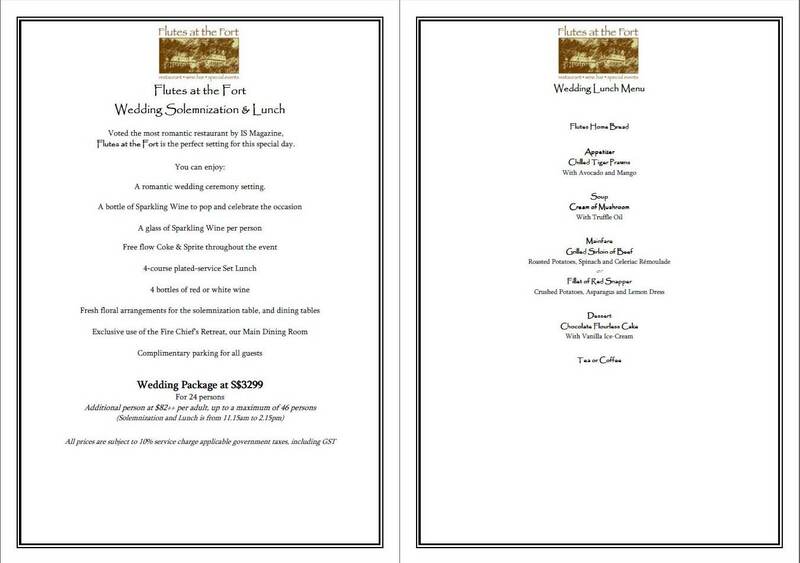 Of course, things were quite flexible at Flutes at the Fort (which I think it is the case with most restaurant wedding), and they agreed to let us utilize the Fire Chief's Retreat with the condition of upgrading the menu. Instead of Sirloin and Red Snapper, the main course is replaced with Beef Tenderloin and Cod. I loved the Seared Scallop and the Flutes' Taste Platter which I tried on their Brunch Menu and a switch is made to feature them on our wedding menu.